Retaining walls are structures created to hold back or retain materials like earth and rock so they won't erode or slide away. Retaining walls are carefully designed to resist the material pressure of the substance it is holding. They provide lateral support so vertical slopes would not collapse. This makes retaining walls a part of every landscaping project. The construction of retaining walls varies depending on the purpose and height of the wall. For steeper slopes and higher retaining walls, it must be built with stability and reliable strength in mind. There are also some locations where permit is required before you can construct bigger retaining walls. It is therefore a must that landscape retaining walls must be handled by licensed and experienced landscape professionals. Homeowners can retain walls in Do-It-Yourself fashion but it can be time consuming and it can cost more if not done properly. 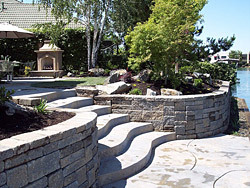 There are professional landscape companies like Design West Landscaping that are experts in doing retaining walls. Through expert consultation and execution, home and establishment owners are assured that the project will be perfectly accomplished. Design West Landscaping has ample experience when it comes to installing retaining walls. In our years of experience in the landscaping business, we already have completed different types of retaining walls like gravity wall, reinforced and anchored wall just to name a few. Gravity walls can be constructed using bricks, stones, or concrete. Other materials used in installing retaining walls are wood sheets, plastic and steel interlocking sheets. But the most common material used in landscaping is the pre-cast concrete blocks which are available in different designs, texture and sizes. Concrete blocks are sturdier and requires less maintenance. Many homeowners prefer this kind of material for retaining walls because it is cheaper as compared to bricks and natural stones. Regardless of the preference of the client, Design West Landscaping will see to it that every retaining wall project that we do complies with the standards so that the final output will stand the test of time. Our company provides excellent retaining wall services as evidenced by positive testimonials from satisfied customers from California. We work closely with clients to ensure that all their concerns will be addressed. Our work begins from consultation where we sit down with clients to discuss every detail of the project from design, types of materials, durability issues, cost and other concerns. 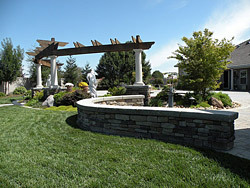 We do not just design and install retaining walls for your landscape. We see to it that every landscaping project that we do in the East Bay Area and around San Joaquin Valley will result to total client satisfaction.